Executing Game Plans & Winning Just Got Easier! Let me explain to you why it’s a challenge for most coaches to acquire the right talent and get them to execute their strategy, and win championships. Sports data is increasing at a staggering pace. Teams are SCRAMBLING to discover how to maximize their analytic programs and increase player value. And significant growth in analytics has created new opportunities to improve coaching, improve player performance and leverage mobile devices to engage player response. It truly is an exciting time for sports and achieving peak performance! The first turnkey sports analytics and management solution that measures player value, builds player IQ and increases team synergy. It enables players to game plan according to the coach’s strategy and team objectives. The Agile Sports Analytics software and framework leverages performance management principals and systems development processes used by thousands of successful business teams, to build a winning sports team and dominate your competition. Many strategist have attempted, but NONE have succeeded…until now! Many sports analytics programs are designed to improve management and coaching decisions. The Agile Sports Analytics software and framework does this as well, but also improves player decisions on the field and helps the team self-organize…a key element to creating team synergy and winning championships. Transforming Player Execution with the Agile Sports Analytics Software! 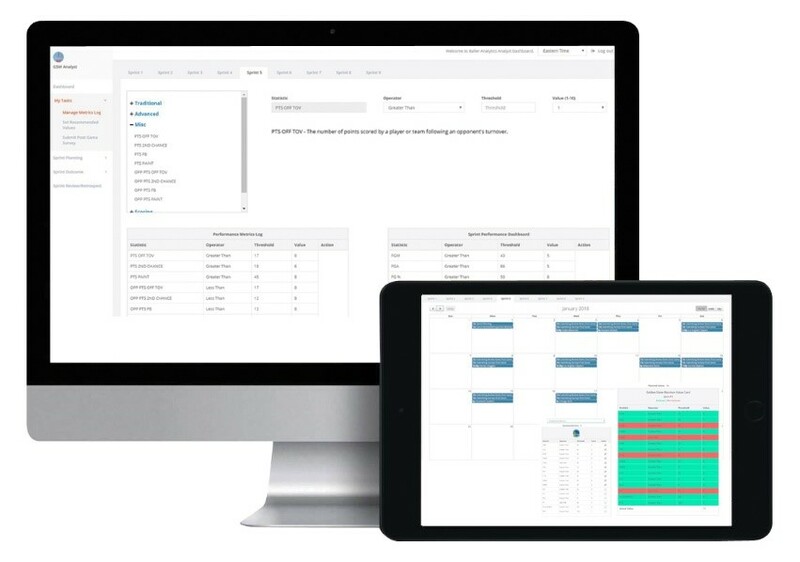 The Agile Sports Analytics software is the first tool that drives the Agile Sports Framework™ processes, events and artifacts from start to finish. It allows coaches to devise a game plan, analysts to set recommended player values, and players to commit to their value metrics, serving both as a strategic tool and a learning tool. It helps owners and coaches identify players who best fit a specific value profile based on your team’s needs, making trades and draft picks more predictable. 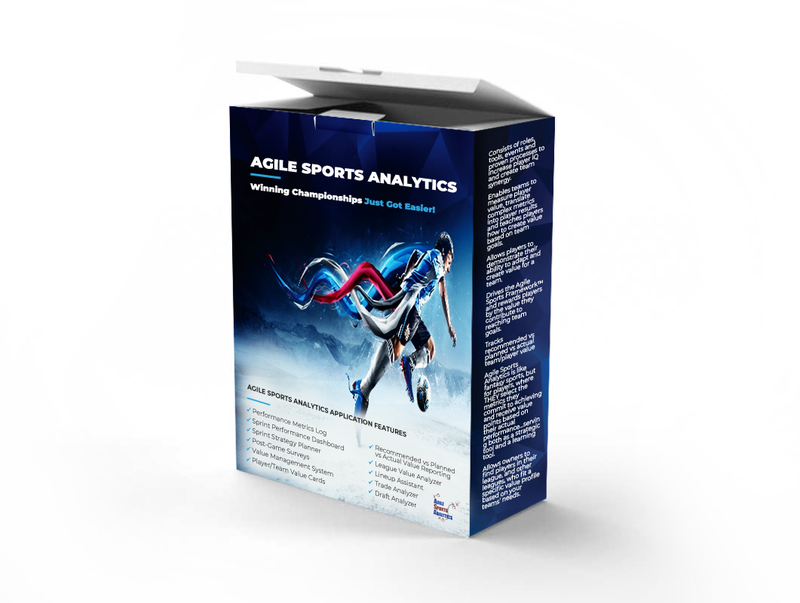 The Agile Sports Analytics software is simple to use, with an easy to read dashboard that allows players, coaches, assistance coaches, analysts, scouts and team advisors to view and execute their responsibilities, such as defining metrics, assigning metric value, setting recommended and planned values, submitting post game surveys, the Sprint Strategy, scouting reports, post-game meeting notes, viewing the Sprint Outcome and Sprint Plan, and more. The secret formula that winning coaches know that 90% don’t are delivered in the Agile Sports Framework and Agile Sports Analytics software. You’re probably worried that this amazing system will be expensive. After all, the system and tools you are about to receive is guaranteed to deliver wins if you take action. So it’s reasonable to expect a large, initial investment, right? Wrong. Acquiring and applying the Agile Sports Frameworks is 100% free. No cost to you. I just want everyone to know about these powerful processes that have given my client’s success for the last 15 years. The Agile Sports Software and Framework is powered by a workflow process that is so efficient that players increase their value almost immediately. And if you believe Agile Sports Analytics can change improve your team’s play…like I 100% ABSOLUTELY KNOW IT WILL, then you can bring me on board to help your team implement it.